Excerpt from book cover: A Pulitzer Prize-winning poet who confessed the unrelenting anguish of addiction and depression, Anne Sexton (1928-1974) was also a dedicated teacher. In this book, Paula M. Salvio opens up Sexton's classroom, uncovering a teacher who willfully demonstrated that the personal could also be plural. Looking at how Sexton framed and used the personal in teaching and learning, Salvio considers the extent to which our histories--both personal and social--exert their influence on teaching. In doing so, she situates the teaching life of Anne Sexton at the center of some of the key problems and questions in feminist teaching: navigating the appropriate distance between teacher and student, the relationship between writer and poetic subject, and the relationship between emotional life and knowledge. 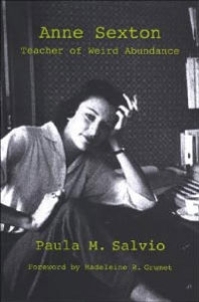 Examining Sexton's pedagogy, with its "weird abundance" of tactics and strategies, Salvio argues that Sexton's use of the autobiographical "I" is as much a literary identity as a literal identity, one that can speak with great force to educators who recognize its vital role in the humanities classroom.